At the regularly scheduled meeting of Edgefield Town Council for March Mrs. Beth Thornton announced that she and her husband George had purchased the Israel Mukashy building on the square and the old Super 10 building on Buncombe Street. 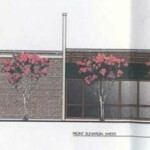 Plans for the Mukashy building include an up market general store and the current florist business. The Super 10 building will be updated and upgraded and will house a pottery studio for 8-10 potters with room for people to rent space on a short or long term basis. There will also be room dedicated to classes for adults and children. Mrs. Thorton continued her presentation with news of the third annual Heritage Trail Pottery Tour and Sale scheduled for May 3rd and 4th this year. 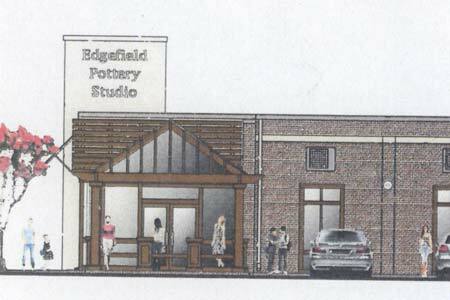 Included in the tour will be Old Edgefield Pottery and groundhog kiln, PK Pottery off of Plum Branch Road and Turtle Rock Pottery behind Beth’s house on Meeting Street Road. Beth Thornton ended her comments with, “Let’s make Edgefield a can’t miss stop for tourists and residents in this area.” Another positive and forward-looking action being taken via leadership of the Thornton family. The Council approved $800 in support of promoting the annual pottery tour. Council then approved funds for modifications of a little league baseball field to meet the facility configuration requirements of new league rules and approved use of the town square by the Veteran’s Affairs Office on May 26 and November 11, 2014 to conduct Memorial Day and Veteran’s Day ceremonies. Council approved the second reading of Ordinance No: 2014-01 an ordinance adopting and enacting a new code for the town of Edgefield, South Carolina; providing for the repeal of certain ordinances not included therein; providing a penalty for the violation thereof; providing for the manner of amending such code; and providing when such code and this ordinance shall become effective. Subject ordinance was approved on second reading and takes effect March 3, 2014. Amendments included in 2014-01 addresses posting of Town Council Agendas, vaccination of animals kept within the town, prohibiting of banners and signs on the square and changes in the title of the zoning board. Mayor Durham then delivered an after action report in regard to the town’s reaction to the recent winter storm and the aftermath. Timely decisions to execute a fall back plan in regard to a warming center at the hospital and the work of volunteers in moving the elderly to subject warming center drew praise from the Mayor and Council. Clearing of debris left by the storm is being conducted as rapidly as possible and the Mayor once again asked that citizens remain patient. Mrs. Gloria Bynam again voiced her concern in regard to the appearance of Mr. Carpenter’s business on Main Street. Councilman Yarborough reported 19 fire calls and three drills for February. Mayor Durham then addressed misinformation, in regard to the 1% Tax Committee work in progress, that had been communicated by an element of the media. The Mayor stated once again, “if citizens want facts they should call me.” Council adjourned.